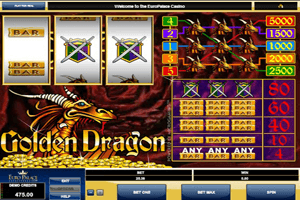 Dragons are well known for their love of gold and this 3-reeled Microgaming slot machine invites players to accompany a Golden Dragon on his pursuit for gold so they can help him achieve his quest while claiming their own share of the fortune. They can do that by placing their bets and then spinning the reels of the game. Play Golden Dragon Slot here. When they do that, they will see that the symbols on the 3 reels and the 5 lines of the game will start to spin and form different combos. Players will have to get 3 matching symbols on one of the payline so they can be eligible to claim the payout that is found at the paytable. The paytable is located on the right side and it will show players all of the different payouts that are available through the game. The symbols include the Golden Dragon himself, a shield and sword and bar symbols. The highest paying symbol is the golden dragon as it can give players up to 5000 coins. They can earn that payout when they get 3 dragon symbols on the reels of the game after placing the maximum bet of 5 coins. These bets can be placed under the reels by going through the available wagering options.